The first part of the Grand Tour includes: Dohány Street Synagogue, Jewish Museum, Martyrs’ Cemetery, Raoul Wallenberg Memorial Park, Tree of Life, Heroes’ Temple, Jewish Center. After a short break we continue our walk through the Jewish Quarter, on the streets of the former Ghetto, where synagogues, monuments, kosher restaurants, and kosher shops can be found. While your guide tells you important facts and local stories from this area, you also get to know more about Budapest. During our journey we visit the Memorial Park dedicated to Carl Lutz, then we pass by the famous Gozsdu Passage. 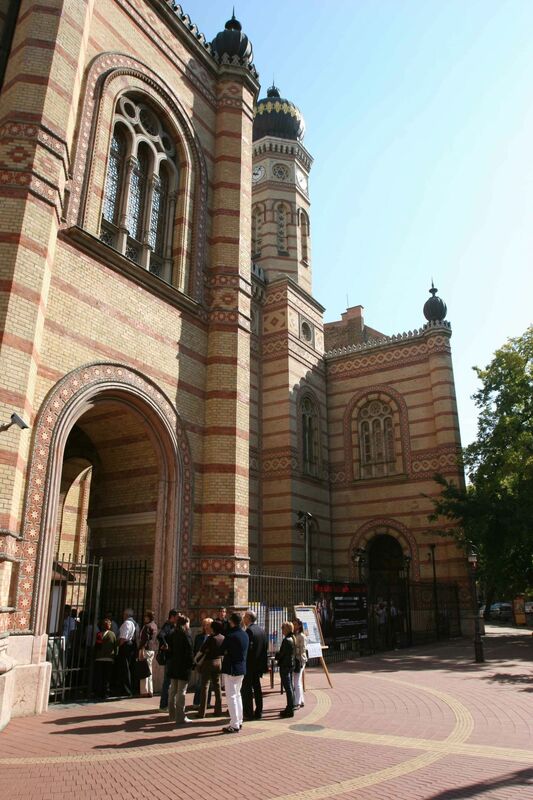 The third station of the Synagogue Triangle is the Kazinczy Street Synagogue (interior visit), which is one of the largest operating orthodox synagogues in Europe, built in art-nouveau style. At the end of the tour, you have two options: you can accept our invitation to have a cake in the glatt kosher Fröhlich confectionery or you can receive 10% discount in the glatt kosher Carmel restaurant. This tour was created for those, who would like to get a overview of the past and present of Hungraian Jewry’s and would like to understand the differences between Hungary's main religious wings. With the help of English-speaking guides you will be acquainted with the most important chapters of the history and culture of the Hungarian Jewry. Budapest is most romantic during the nighttime with the Danube reflecting the illuminated view. The Hungarian capital has most of the amazing sights right next to the Danube, the river that connects 7 European countries and is a UNESCO World Heritage Site. In 2 hours, you will see the House of Parliament, the Royal Palace, the Gellért Hill and the 6 bridges with great historical importance. We start from the oldest bridge of the city, the iconic Chain Bridge. Open buffet dinner is available for guests who want to try out the traditional Hungarian cuisine. The meals on our ships are prepared by Chef Molnárka Péter, including various Hungarian dishes, cold entreés, international favourites, vegetarian meals, desserts and much more. On top of that, a welcome drink and two more drinks while cruising are also included in the ticket price. While enjoying your dinner, you will be listening to 3 artists of the Rajkó Gypsy Orchestra live. The show features an extremely talented player of the most famous Hungarian instrument, the “cimbalom” as well. During the performance, guests will have a chance to ask for their favourite songs from the artists to play. The panorama of the city is best from the open upper deck of the boats. H - 1051 Budapest, Zrínyi utca 5.